Performer shows a rod with six different coloured gems on it. 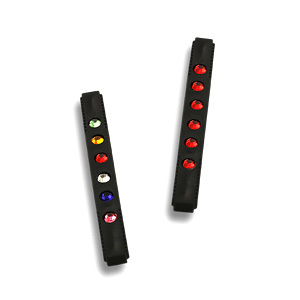 There are also six different coloured gems on the opposite side of the rod. Spectator selects one of the six colours. Performer magically changes all the gems to the selected colour on both sides. To always carry in your pocket! - Easy to do and with a great impact on all kind of audience. - The bar, made of plastic, measures cm 13 (l) x 1,2 (h) x 0,9 (p) (in. 5,13 x 0,47 x 0,35).